This the third of three notes that summarise developments in 2013. Note 9 deals with items 1-3 below. Note 10 deals with items 4-6 below, and this note deals with items 7-9 below. 6. which led to HMG taking a number of decisions aimed at improving civil service accountability. 7. Ministers were then reported to be disappointed with the performance of Sir Bob Kerslake, their own appointment as Head of the Civil Service. 9. The PASC recommended the creation of a Parliamentary Commission to look at the relationship between Minsters and civil servants. If confirmed, this would be an ironic outcome for the man who had been specially chosen as a reformer (note i), who had made it clear that he thought that Ministers’ reform plan (note ii) was badly designed (note iii), and who would have entitled to refuse the challenge once the Plan had been implemented (note ii). Note ii. The first set of proposals in the Reform Plan would require politicians to hold back on announcing exciting proposals and would require civil servants to block politicians’ manifesto promises unless the civil service thinks the plans are feasible etc. (The tension between the two is often caused (a) by the gap between policy aspiration and the implementation plan, and (b) by Ministers tendency to will the ends without willing the means - or even understanding the need for them). Note iii. The Mail on Sunday reported in May 2012 that ‘Whitehall was shaken last week by a heated row between the Government and the Civil Service over how to reform the bureaucratic machine. Steve Hilton, the Prime Minister’s passionate senior adviser who leaves for a one-year unpaid sabbatical in the US this week, even stormed out of a meeting with the head of the Civil Service, Sir Bob Kerslake, in frustration at the latter’s approach. At the heart of the row is the Civil Service reform White Paper.’ Sir Bob’s colleague, ex-Accenture change management specialist Ian Watmore, had sensibly bailed out in June 2012. It was interesting that Bob Kerslake told Civil Service World in June 2013 that the Government was likely to implement a further set of civil service reforms as it pursues ‘unfinished business that didn’t make it into the 2012 Civil Service Reform Plan’. But the few hints that were available did not suggest that he had any dramatic changes in mind. The NAO report certainly (‘though only implicitly) highlighted the unpredictable consequences that might flow from the Government’s 2012 Civil Service Reform Plan. Would officials who were faced with unrealistic Ministerial demands (a) refuse to sign them off (thus damaging their relationship with their Minister), or (b) sign them off and take the risk of the project failing down the line? The Treasury were always highly sceptical, arguing that "there was a good reason why there were lots of different benefits, and that is because every family is different. 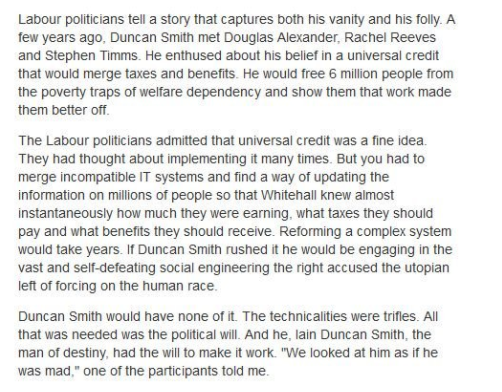 IDS was messianic in his desire to see this through, but like many false messiahs his miracle won't work." And of course implementation will require co-operation across several government departments, including DWP, Treasury, Communities and Local Government, etc – and again, we all know how good Whitehall is at joined-up government… Here’s just one example from the White Paper: “Recipients who have earnings from employment will have those earnings automatically taken into account. We intend to use HM Revenue & Customs proposed real-time information system to identify earnings and to calculate the net Universal Credit payment due by applying the appropriate taper to the gross payment. This means that those recipients who receive earnings through Pay As You Earn will not need to inform us for payment purposes if the amount of their earnings change.” Good luck with that. Just think about the implementation muddles the Government has managed to generate around the relatively simple proposed change to Child Benefit and multiply that by thirty and you get some idea of the train wreck on the horizon. Just read Chapter 4 of the White Paper, and weep at the naïve optimism. And of course, all of this requires primary legislation before they can even start to specify and sign-off development plans for the systems and technology needed to make this all work. "The Civil Service is one of the great institutions of state, critical to the continuation and stability of government, and it needs to change to meet the changing demands placed upon it. The Government recognises this and last year, launched the Civil Service Reform Plan (updated in July this year by the One Year On plan). The Government describes this as a programme of "incremental change". Some of the reform proposals, such as the introduction of more "personalised" appointments in the Civil Service, including a much greater ministerial role in the appointment of permanent secretaries, are controversial. Many fear such changes challenge the Northcote-Trevelyan settlement, which established an impartial and permanent Civil Service with officials appointed on merit alone. We wish to make it clear that the Civil Service Commission has our fullest support on this matter. The Government has not however identified any fundamental problem with the Civil Service and the Minister, Francis Maude, says he does not believe that fundamental change is necessary. We conclude that "incremental change" will not achieve the change required. Unless change is clearly heralded and given high profile leadership by a united team of ministers and senior officials, it is bound to fail. Tensions between ministers and officials have become all too evident in recent years. We recognise that many ministers feel their decisions are being deliberately blocked or frustrated, but this points to a more deeper problem in our system of government. There is a fundamental question about why ministers feel some civil servants are resistant to what they want and this question has not been considered in any systematic way. Failing organisations demonstrate common characteristics, such as a lack of openness and trust, which are very evident in some departments and agencies. In our deliberations with ministers and civil servants most recognise a prevalence of these behaviours. We remain unconvinced that the Government has developed the analysis, policies and leadership to address these problems. We have found that both ministers and senior civil servants are still somewhat in denial about their respective accountabilities. The present atmosphere promotes the filtering of honest and complete assessments to ministers and is the antithesis of 'truth to power'. It is a denial of responsibility and accountability. There is a failure to learn from mistakes and instead a tendency to look for individuals to blame. The Haldane doctrine of ministerial accountability is not only crucial to Parliament's ability to hold the executive to account. It is at the core of the relationship between ministers and officials. We repeat our recommendation from 2011 that the Government should consider whether the Haldane doctrine of ministerial accountability remains appropriate for the modern age, and how it could be updated. The Fulton Committee, which reported in 1968, was expressly excluded from consideration of the relationship between ministers and officials. There has been no independent examination of the Civil Service since then, despite the huge changes in the UK and our place in the world since then. The Government's limited proposals do not set out how a sense of Haldane's indivisibility between ministers and officials can be created. Departmental civil servants are in an invidious position with conflicting loyalties towards ministers on the one hand, and to the permanent secretary on the other. This is made much worse by the rapid turnover of lead officials, which is incompatible with good government. This Report is exceptional. We make only one recommendation: the establishment of a Parliamentary Commission into the Civil Service, in the form of a joint committee of both Houses. The independent evidence in favour of some kind of comprehensive strategic review of the nature, role and purpose of the Civil Service is overwhelming. Our critique of the Civil Service Reform Plan and its limited implementation underlines this. The objections raised by the Minister for the Cabinet Office, and by the leadership of the Civil Service, are unconvincing and can be seen as part of what Francis Maude has described as the "bias to inertia" which he says he is seeking to address. On the one hand, the Government insists that the present reforms are "urgent". On the other hand, they are too modest and piecemeal to address the root causes of the frustrations which ministers feel beset them or to lead to the kind of transformational change that many believe that the Civil Service needs. Sustained reform has to be initiated by cooperation and supported by external scrutiny and analysis that leads to a comprehensive set of recommendations for change. This cannot be done by ministers and officials who are, as they say themselves, so pressed by far more immediate and high-profile economic, political and international issues. We cannot emphasise enough the importance of this recommendation, reflected by the unanimous support of the House of Commons Liaison Committee. Such a Commission could draw on the extensive experience of government and the Civil Service in Parliament and its conclusions would enjoy cross-party consensus. The Commission should undertake this work alongside current Civil Service reforms, not as an alternative. It should focus on the strategic long-term vision for the Civil Service, for which the Government, in its One Year On report, has recognised the need. The fact that more radical measures that challenge the Northcote-Trevelyan settlement are also being discussed underlines the need for Parliament to oversee proper consideration of issues that are fundamental to the way our uncodified constitution operates. The Civil Service does not exist solely to serve the Government of the day, but also future governments. It is right and proper that substantial reforms to the role of the Civil Service should be scrutinised by Parliament. Such a Parliamentary Commission could be established before the end of the year, and report before the end of the current Parliament, so that after the 2015 general election a comprehensive change programme can be implemented." It was greatly to the credit of the FDA, the senior civil servants trade union, that it welcomed this recommendation. The next note in this series (Note 12) looks at subsequent developments later in 2013.